New Red Dawn Movie Blows Detroit Away! The Chinese-infused Red Dawn re-make's been blowing crap up filming this week in Detroit. The city's an awesome place for making a movie. 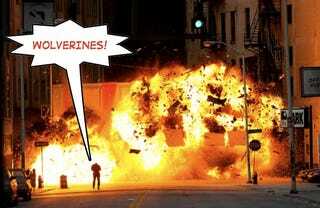 Just ask Michael Bay. He's been blowing crap up filming in Detroit for years. Set pictures below. Not only is Detroit a great place to film a movie like Red Dawn 2 because they'll allow you to blow up downtown buildings without a care in the world, but also because folks in certain parts of the region will futilely shout the name of a certain non-indigenous-to-Michigan furry animal on a fall Saturday without any prodding whatsoever. Usually it's with the word "Go" attached to the front of it — but that can be fixed in post-production, right? Anyway, here's the shot of that Humvee we were talking about above. We knew selling Hummer to the Chinese would lead to disaster — and us having to fend off the red menace with nothing but a Dodge Ram. There's a slew of other pics of filming in downtown Detroit here. Anyone else take any shots? If so, drop 'em in the comments below.